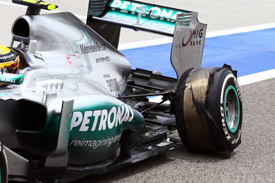 The Italian tyre manufacturer initially suspected that a piece of metal – which also punctured a tyre on Giedo van der Garde’s Caterham on the same part of the track – was to blame for Hamilton’s problem in final practice. The incident required Mercedes to make a gearbox change, costing Hamilton a five-place grid penalty. But after conceding that the failure was not typical of a normal puncture, Pirelli is taking the tyre to its Milan headquarters to work out whether debris did contribute or not. Throughout the weekend, Mercedes was struggling with high rear tyre temperatures, which could also have played a part in the tyre failing in the way it did. Pirelli motorsport director Paul Hembery told AUTOSPORT that further examination of Hamilton’s tyre was essential, while there was no doubt that Felipe Massa’s double failure in the race was entirely down to debris. “The Hamilton tyre is something that we need to look at a lot more to understand as we are not really sure about how it happened,” Hembery explained. “There is very little evidence there, other than overheating, about what it could be. “The only thing we have is that van der Garde was following Lewis, and he picked up a huge cut through the top of the tyre at the same time. Pirelli has a mobile laboratory that it takes to every race, but Hembery said any action about the tyre failure would only be taken after a detailed forensic analysis back at its headquarters. “We will take all the pieces apart and do a full lab analysis,” he said.